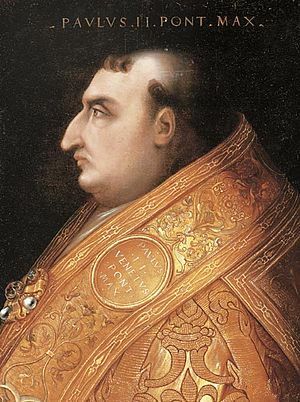 Pope Paul II (Latin: Paulus Secundus; 23 February 1417 – 26 July 1471), born Pietro Barbo, was an Italian priest of the Roman Catholic Church and the 212th Pope from 1464 until his death in 1471. Pietro Barbo was born in Venice. He was a nephew of Pope Eugene IV. Barbo became a cardinal in 1440. He was sometimes called the Venetian cardinal. Barbo was elected Pope on 30 August 1464; and he chose to be called Paul II. The Cardinals' right to wear the red biretta was granted by Paul II. The accounts of histories written soon after his death were unfavorable. Pope Paul II Facts for Kids. Kiddle Encyclopedia.